Tonkin Snub-nosed Monkey (Rhinopithecus avunculus) is considered one of the 25 most endangered primate species in the world. Until the early 1990s, the species was believed extinct. 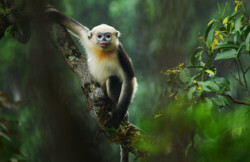 The endangered snubed-nosed monkey is only known for northeastern Vietnam, with a rapidly declining population of only about 250 individuals at three separate locations. The monkey is named for the area of Vietnam in which they are found (Tonkin). They are characterised by their upturned noses, rimmed eyes, bushy ears, and vey long tail. 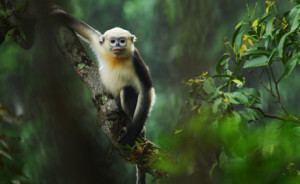 Tonkin snub-nosed monkeys are threatened by hunting and loss of habitat. Hunters use monkey bones for “medicinal” purposes, and are still able to sell this to outside traders to the illegal market. The species is strictly protected by Vietnamese law. Their habitat also suffers from continued disturbance by illegal logging and occasional mining, leaving less suitable forests available to the decreasing monkey population. PRCF helps to protect the Tonkin Snub-nosed Monkey by surveying and mapping their critical habitat, and by providing support into conservation management. We help Na Hang Nature Reserve, home to a population of about 40 monkeys, with identification, conservation planning, and management of Critical Conservation Zones.